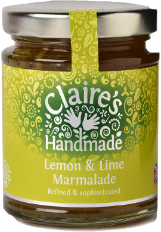 A refined and sophisticated marmalade with a lovely tang reminiscent of breakfasts of times past. Fabulous on breakfast toast and pastries and makes a wonderful citrusy vinaigrette for a summer salad to serve with barbecued fish or meat. Dalemain World Marmalade Awards 2016. Allergens in CAPITALS. Sugar, lemons 15%, limes 15%, gelling agent: fruit pectin, acidity regulator: citric acid. Prepared with 30g fruit per 100g. Total sugar content 63g per 100g.